Once upon a time sandwiches were boring affairs. 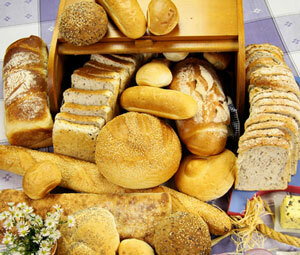 But all that has changed with the arrival of so many new bread varieties, fillings and spreads. No longer are sandwiches confined to just a few slices of white bread. The vast array of different breads, rolls, bagels, flat breads, tortillas and wraps now available brings a new dimension to the humble sandwich elevating it to new culinary heights and means that finding new sandwich ideas is relatively easy. But sandwiches, like everything else, can be made healthy or unhealthy. To make your sandwiches healthier, use whole wheat or grain bread. Rather than using butter try one of the reduced-fat margarine spreads. 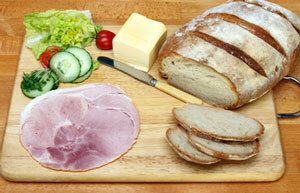 When choosing fillings choose low fat cheeses and opt for lean cuts of meat such as ham, chicken or turkey. 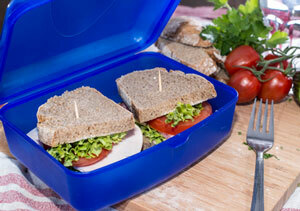 How do you ensure that your lovingly prepared sandwiches last until lunchtime without becoming crushed or soggy? Packing them in a plastic container will prevent them becoming crushed in overloaded school bags. If the weather is warm and humid using an insulated bag with an ice pack will keep them much fresher and prevent fillings from spoiling. Have you ever opened your lunch box to soggy sandwiches? Not very nice or appetizing. So how do you avoid the dreaded soggy sandwich? The first trick is to form a barrier between the wet fillings and your bread. Butter or margarine forms a natural barrier preventing moisture from seeping in. If using condiments or spreads, place them between the meat and cheese rather than on the bread. The other alternative of course is to pack the wet ingredients in a separate container and assemble the sandwich just before eating. Flat Italian loaves, can be split and filled. Indian bread. Split and fill or use with dips. Split and wrap fillings, or halve and fill pockets. Danish, dark rye bread. Top with savoury fillings. A dense, yeast-free loaf, good for sandwiches and toast. Butter can be high in saturated fat so you may want to avoid it. But there are so many other low fat alternatives that are tasty and low in fat. Sandwiches can be filled with almost any combination of cheese, meat and vegetables. 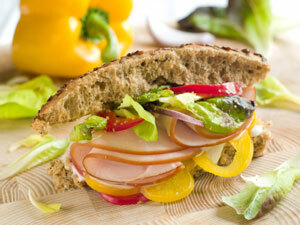 The trick is getting the right balance of flavor and texture while keeping the sandwiches fresh and appetizing. Soft cream cheese can be used as a spread or as part of the filling. Slices of mild cheddar are ideal for children’s lunches and can be combined with almost any salad vegetable and other meats. Now it's time to put it all together. Here are a few sandwich ideas to give you inspiration next time you are wondering what to prepare for school lunches. Remember you can mix n’ match any of the above ingredients. Combine tuna with mayonnaise, top with baby spinach and sliced avocado. Combine 1 can drained and flaked tuna with 1 can drained corn kernels, 1 tablespoon mayonnaise and 1 tablespoon chopped curly parsley. Don’t forget to use fresh herbs such as coriander, chives, parsley and basil for extra flavor.